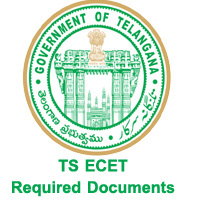 TS ECET Required Documents list is available here. Check TS Engineering Common Entrance Test necessary Certificates to attend for counselling. The applicants who qualified in Telangana State ECET exam can attend for the certificate verification. TS ECET is only for the Diploma and B.Sc students. Aspirants who completed their B.Sc Degree and Diploma are eligible for the TS ECET exam. The applicants who qualified in the TS ECET exam can attend for the Counselling. For attending certificate verification the applicants have to gather the necessary documents. We had given the TS ECET Required Documents list in the below sections. So, while going for certificate verification the applicants have to carry the mentioned documents list with them. The interested candidates had applied and sent their online applications for JNTU Hyderabad. Before the exam, the Jawaharlal Nehru Technological University released admit cards for the applied candidates. The willing students downloaded the admit cards for attending the TS Engineering Common Entrance Test exam. The JNTUH successfully conducted TS ECET exam on scheduled dates. Many students attended the Telangana State ECET Exam. Now it’s time for the Telangana ECET Certificate verification and Counseling. Therefore, the applicants who are qualified in the TS ECET exam can attend the counselling along with the required documents. The applicants have to check that they have all the below certificates or not. Attend the TS ECET Counselling with the below documents. TS ECET 2019 Rank Card. Diploma / Degree Provisional Certificate. Study Certificate from IV to Diploma (9th class to degree in the case of B.Sc). TS ECET 2019 Hall Ticket. Income Certificate issued on or after 01.01.2019 by competent authority, if applicable. Integrated Caste Certificate issued by competent authority, if applicable. Physically Challenged (PH) / Children of Armed Forces Personnel (CAP)/ National Cadet Corps (NCC)/ Sports and Games/ Minority Certificate, if applicable. Special category candidates can check this section for complete information about the Required documents list for TS ECET 2019 Counselling. Categories such as PH/ NCC/ CAP students need to carry some extra documents along with the above certificates. Candidates with 40% and above disability are eligible for TS ECET exam. A Certificate which is given by Direct Medical Officer. If in the case of Servicemen discharge book. Zilla Sainik Welfare Officer gives a certificate. When joining in the service, the applicants should record permanent address or Home Town in the service register under CAP category. The applicants have to submit original certificates provided by competent authorities. The applicants have to submit all the original certificates with 2 xerox copies at the time of the TS ECET Counseling and certificate verification. so they are not giving me the “transfer certificate” which is mandatory for certificate verification. Sir, I don’t have any residential proves like residential certificate .is it important ? ?please tell me as early as possible . Sir for the counseling we should attend only in our dist’s??? Or were ever we need???? Is these certificates are enough for counselling. Yes u can attend counselling but the residence certificate is pending at counselling time. Is resident certificate is essential for counselling ? Sir should i pay total fee if my income certificate is kept pending in counselling ??? Please reply ? I completed my diploma in mechanical from AP sbtet. Now I’m willing to study in telangana state may I know I’m eligible , what type of documents I need. Sir I have completed my schooling in AP and I had done my diploma in telangana. For ever counciling they are asking 10yrs of residence certificate. But I had residence of 6yrs only but my parents are staying more than 10 yrs in hyd. What I had to do now sir. Residential certificate is required for ecet counselling sir. Sir I have lost my diploma 1 year and 3sem memo but I have the others so are they enough or do I need them ..
SIR I lost my 1st Year original memo . What shouls I do now ? how many xerox sets were required for counselling sir…. Sir i applied for caste n income certificates at meeseva i didnt got certificates till now so can i show my application reciept behalf of certificates….? Same problem….If you got the solution please kindly inform me….